Scott Stossel is an anxious human. He is quite possibly the most anxious human I’ve ever had the good fortune of “meeting,” if you can call it that. Scott has multiple, extreme phobias: in particular, vomiting, flying, and public speaking. He suffers terrible anxiety-induced digestive problems. He has had too many panic attacks to count. And he has been on almost every antidepressant and anti-anxiety medication in existence. My anxiety, much like Scott’s, began when I was a child. However, my anxiety, unlike Scott’s, is not (well, not most of the time) debilitating. I had no idea that one could suffer from anxiety to the degree that Scott does. If you’re on the edge about this book, consider picking it up at least to read the highly detailed anecdotes about Scott’s experiences with anxiety, including the time he overflowed a toilet while staying in a house with the Kennedys, his wedding-induced panic attack at the altar, and his disastrous attempt to conquer his fear of vomiting. They were hilarious–he does a great job of making light of what were clearly terrible, traumatizing situations for him. 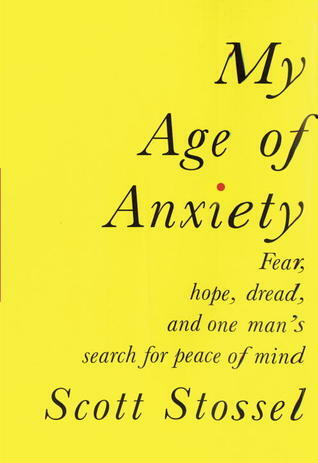 I enjoyed My Age of Anxiety, and I think anyone with an interest in anxiety or personal experience with it would learn quite a bit from reading this tome.